The Connecticut Department of Labor's Office of Research gathers, analyzes, and disseminates information on the economy, workforce and careers that is used to evaluate the economic health of Connecticut, to support and promote state workforce development activities, and to assist students and job seekers in making career choices. We recognize that the employment, occupational, and other data we collect, develop and transform into useful information, commonly referred to as Labor Market Information (LMI), are essential for career decision-making and for establishing workforce-training opportunities. Find the most current estimates of nonfarm employment, hours, and earnings data by industry for the state and major metropolitan areas. Covered employment provides a quarterly count of all employees covered by Unemployment Insurance. It provides more industry and geographic detail than the CES data, but it is not as current. Search for Connecticut Employers by industry, geography, occupation or company name. Find the largest companies in Connecticut or search all by region, WIA, or town. Click on a company name to view more information about that employer. This employer information is provided by InfoGroup®. Find current and historical unemployment rates and labor force statistics by area here. Provides accurate and meaningful wage information to employers, job seekers, counselors, students, anyone in need of wage information. Employers may find the data useful as a guide in analyzing pay scales; job seekers and students could utilize the information in making employment and career decisions; program planners should be aware of employment and wage levels in determining training programs to be offered. Taken together, this group of economic indicators presents an overall picture of the current conditions in the CT labor market, business climate, and consumer sector. Charts, trends, year-to-year changes and data for twenty-four economic indicators. As a planning tool, this data will help assess how technology and growth will continue to affect our industrial make-up and the types of careers in demand over the next decade. By doing so, employment and training specialists, counselors, students, and others who need information on future employment will have the tools necessary to make informed career choices. Find a job! Explore Careers! Make your resume available to leading U.S. employers. Schedule Job Search Agents to search for new matches automatically on the schedule you desire at Connecticut's Job Bank! A stop-by-step guide to the world of work - choosing an occupation, finding appropriate education and training, and finding the right job. Find schools and training providers in your area that offer the program or course you are interested in or those that will prepare you for the your chosen occupation. Research careers in the Science, Technology, Engineering and Mathematics. Job hunting requires some creative thinking. CT’s Reemployment Portal helps you think about occupations and find jobs that match your skills and experience. Employment information of graduates of Connecticut’s public colleges and universities. The Office of Research gathers, analyzes, and disseminates information on the economy, workforce and careers that is used to evaluate the economic health of CT, to support and promote state workforce development activities, and to assist students and job seekers in making career choices. 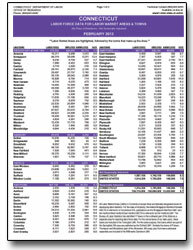 At-A-Glance is a monthly pamphlet that contains the latest updates for data items most frequently requested. Taken together, this group of economic indicators presents an overall picture of the current conditions in the Connecticut labor market, business climate, consumer sector and the current/future overall. Charts, trends, year-to-year changes and data for twenty-four econcomic indicators from 2000 to current. For graphs & data follow the links below the column headers. Provides quarterly labor force information for Connecticut and its nine labor market areas. Includes statewide and labor market area estimates of total labor force, unemployment rates, and unemployed women and minorities. Information on the broad occupational skills of women and minority job seekers registered with the CTWorks Career Centers can also be found here.